How did American dollar bills change? The first money went into circulation since the middle of the 18th century. They were used in North America in all the colonies, which at that time numbered 13. Depending on the location of the location, they were called either a dollar or a shilling. The banknotes were constantly forged, so the government was constantly improving their protection. 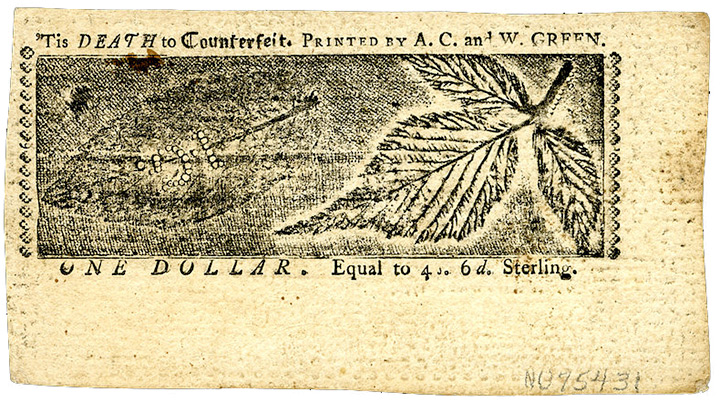 For this and printing on banknotes of complex patterns, real leaves were also used. Also, for the forgery of bills, execution was determined. At the end of the US War of Independence, the Continental Congress issued the first national currency, the american dollar. 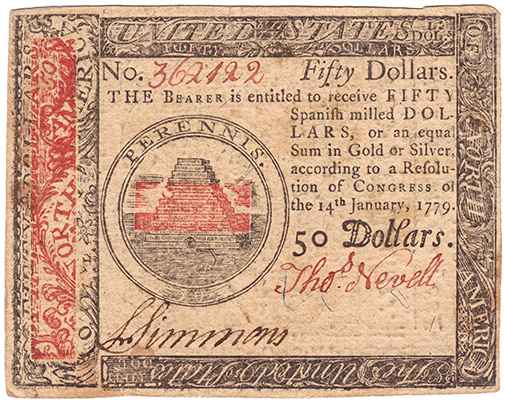 The design of continental dollars was not much different from colonial banknotes. But it was on them appeared an unfinished pyramid, which you can contemplate on the back of the dollar bill. Issue of banknotes totaled 240 million dollars, which subsequently caused a monstrous inflation, which by 1781 led to its depreciation. Some stability was restored only after the signing of the Coin Act in 1792. A clear and logical monetary system was established, including both gold ten-dollar and copper half-cent coins, which were minted at the state mint. But the printing of banknotes was not so smoothly, because in their value depended on the financial condition of the institutions with which they were printed. So for a denomination of 5 dollars, issued by the Agricultural Bank of Tennessee gave only $ 4. Soon such a position used fraudsters, proceeding to issue counterfeit banknotes through one-day banks. The next period in the development of paper bills was the Civil War. To maintain soldiers, the seal was produced in enormous sizes. The departed states began issuing their own currencies, which have no security. In those days, the dollar has already begun to create a distinctive design - simple, but at the same time having an ornamented border and two-color printing. In 1862, a law was signed to start issuing notes for $ 50 million, which were provided with government securities. But their existence did not last long. The following year they were withdrawn from circulation. At the end of the war, the country's financial system entered a new level, which is called the golden age of design of banknotes. In addition to the greenbacks, the issue of silver certificates was launched. Silver certificates, in turn, could be exchanged for coins and ingots of silver. The year 1886 was remembered by the first design of a banknote depicting a real woman of the "first lady of the country" - Martha Washington. In 1892, the Treasury issued an educational series. The issue was held in honor of the World Exhibition and was considered the most beautiful in the history of the development of US notes. On a one-dollar bill, they portrayed Colombia pointing to Washington's monument. The design of this banknote traces a huge number of complex elements, thanks to which this series and became famous. On the denomination of $ 5, the bankers depict an allegorical scene "Electricity brings light to the world," thereby indicating America's leadership in technological innovation. It was thanks to the silver certificates that the borders of the banknotes and the sizes of the portraits appeared, that is, the foundation was laid, in addition to the silver certificates, gold was also issued, giving the right to the gold deposited in banks, sometimes reaching amounts of 10 thousand dollars. The turnover was until 1933, until the announcement of the ban by President Roosevelt on the accumulation of gold from private individuals. In the 20th century gold certificates were issued with all of us so familiar and familiar image of Washington. The difference is only in the use of "golden" tone and tri-color printing at these times. The classical design of banknotes has its roots from the beginning of the 20th century, when the Law on the Federal Reserve (1913) was adopted. The initial range of colors consisted of black and white-red tones. After, I would like to note, the beginning of the most radical reform, during which banknotes were reduced to the size of 15x6 cm (with the original size of 19x8 cm). First of all, the reduction in size was done to save paper. In circulation, there were bills not only to all the usual one-, five-, ten-, twenty-, hundred-dollar bills, but also in nominal value of five hundred, thousand, five thousand and ten thousand dollars. Denominations of five hundred, one thousand, five thousand and ten thousand stopped printing in 1934. من الملاحظ هنا في في هذه العملة التي صدرت عام 1779 أن الهرم الماسوني ناقص، فيتكون من 13 مصطبة، وهو نفس عدد المصاطب على عملة الدولار الحالي الذي امتدت عملية تصميمه على مدى ست سنوات ومن خلال ثلاث لجان. تم تقديم الاقتراح النهائي، الذي تم قبوله من قبل الكونغرس، في 13 يونيو 1782، من قبل تشارلز تومسون ، وهو تاجر بارز في فيلادلفيا وسكرتير المؤتمر القاري. ويعود إليه الفضل في وضع اللمسات الأخيرة على التصميم - لتوحيد أفكار اللجان الثلاث، ومستشاريها، والفنانين. ولكن الفارق بينهما أن الهرم بلا قمة مدببة كما في الدولار الحالي، وهذا بحاجة إلى بحث عن السبب في عدم إضافة القمة، أو لما تمت إضافة القمة المثلثة فوق الهرم؟ هذا مع وجود بوابة صغيرة أسفل الهرم، والتي اختفت من الهرم في الدولار الحالي. رمز رأس الزاوية مأخوذ من [مزمور: 22:118] (الْحَجَرُ الَّذِي رَفَضَهُ الْبَنَّاؤُونَ قَدْ صَارَ رَأْسَ الزَّاوِيَةِ.). وقد اقتبس في الإنجيل في عدة مواضع، فيفسره الصليبيين كما يقول الخوري كامل يوسف كامل على النحو التالي: "لماذا شبه يسوع بالحجر الذي رذله البناؤون؟ يقال أنه عندما بني هيكل سليمان وجد البناؤون حجرا كبيرا مرميا، ظنوا أنه لا يصلح لشيء، فرفضوه واحتقروه ورموه خارج البناء. وعندما وصلوا الى الزاوية وهو المكان الذي يلتقي بهما الحائطان (الانسان والله) ليكتمل البناء لم يجدوا حجرا يصلح لربط الحائطين وتشكيل الزاوية الا الحجر الذي سبق لهم ورذلوه ورفضوه وحكموا عليه بالموت على الصليب موجهين له الاهانات وأحقر العبارات وأشد العذابات حتى الموت، دون أن يعلموا أنه هو الوحيد الذي يربط الله بالانسان والانسان بالله."